On March 19, 1945, America stood upon the threshold of victory over the German Third Reich. And Japan, the nation that had ushered America into the Second World War, was steadily crumbling beneath the overwhelming power of American naval, land, and air forces. Many great battles were yet to be fought; the instigators of the war would not succumb easily or without great costs to their conquerors. At 7:00 AM that morning, the young sailors aboard the USS Franklin,CV 13, had no idea that within 7 minutes they would enter the annals of American naval history, taking part in one of America's most harrowing epics at sea. 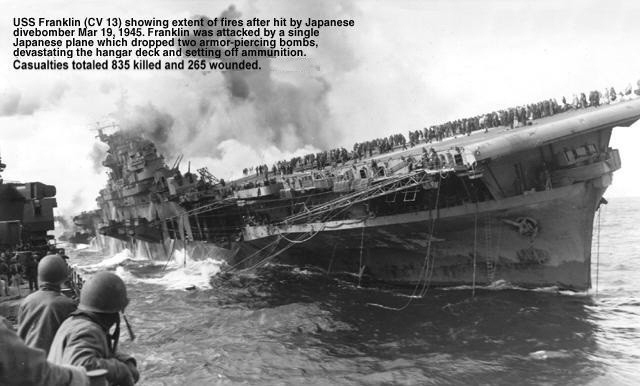 The Franklin's story began on December 7, 1942, the first anniversary of the Japanese attack on Pearl Harbor, when her keel was laid in a graving dock of the Newport News Shipbuilding Company, on Virginia's Atlantic Shore. The Franklin was the fifth ship of the Essex class to be constructed. After Pearl Harbor the American industrial complex had responded swiftly and decisively to Roosevelt's December 8th declaration that "No matter how long it may take us, America in its righteous might will overcome and win through to absolute victory." Before the end of the war America would construct 24 Essex class carriers.